I put together a single family homes sales report for the Fort Mill SC area for your review. The data is for March 2009 single family home sales with a comparison to March 2008. The data is from the Charlotte MLS and the area is Fort Mill, SC which includes communities like Baxter Village, Springfield, Knigthsbridge, and other Fort Mill communities except for Tega Cay SC. In March 2009, 21 single family homes sold in Fort Mill compared to 30 sold in March 2008 which is an approx decrease of 30%. The average days a home is on the market has increased 47% to 181 days. The sale price to listing price percent is at 95% of listing price. There are currently 789 single family homes for sale listings in the Fort Mill area on the Charlotte MLS service.? 581 are active listings in the combined York County and Lancaster County of the Fort Mill Township. There are 372 active listings in the York County portion of Fort Mill. 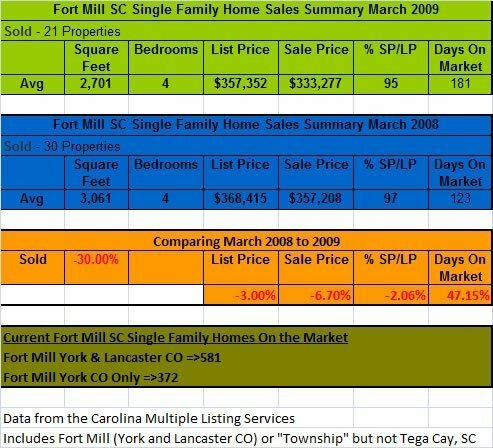 I put together a colorful spreadsheet below summarizing the March 2009 to March 2008 Fort Mill homes sales comparison. So 30-40 homes per month, and 800 homes currently on the market. That would take 20 months then if no new homes came on the market, right? We know that won’t happen. If anything I would expect the rate of homes coming onto the market might increase. With the uncertainty of the Charlotte banking industry too I’d say it might continue to be another tough 2 years or so. What do you make of this data? Let me break out the numbers a little more. The good news is 193 of the 800 listings are pending sales. The number of homes listed in the York County portion of Fort Mill is 372. So the absorption rate is much better than you calculated. There seems to be more sales activity this month than last. So things are seasonally picking up. But, the homes for sale inventory is strong. Buyers have a lot of choices. Sellers will have to weigh this fact when they are trying to decide whether to put their home on the market, keep their home on the market, making sales price decision, or making a decision on whether an offer from a buyer is acceptable or not. It is still a buyers market! When will you have updated information? In this market, information becomes outdated very quickly?